On the night of the 21st of November 1940, a lone Luftwaffe bomber dropped a parachute mine over Abbey End. 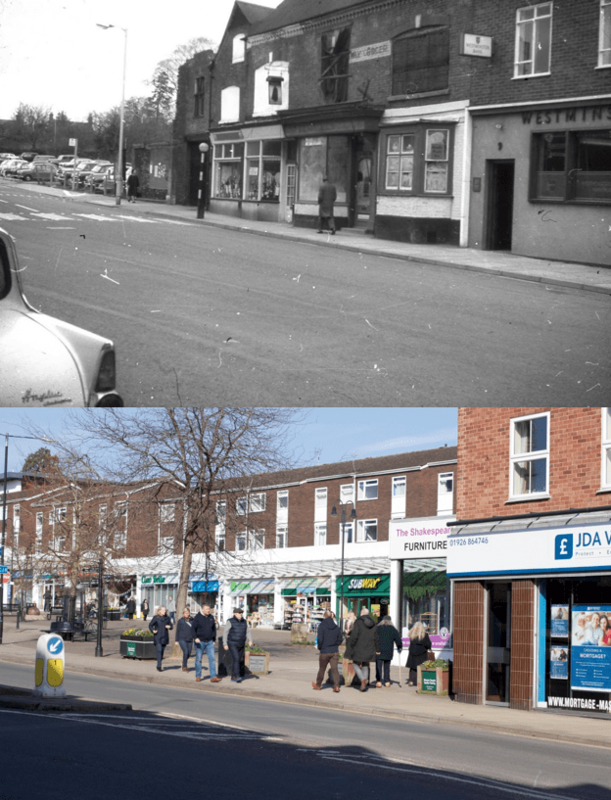 The above-ground explosion destroyed a swathe of the densely packed shops, houses and pubs and resulted in the tragic deaths of 26 people, many of whom were refugees from Coventry who had come to Kenilworth hoping to escape the Blitz. A further two casualties resulted from smaller bomb incidents elsewhere in the town, bringing the total of deaths from the Blitz in Kenilworth to 28, from a population of fewer than 10,000 people. Several buildings at Abbey End were destroyed in the initial blast, including including much of the Globe Inn. Others, such as Lord Leycester’s Lodge were damaged beyond repair and subsequently demolished. Some damaged properties soldiered on for another few years until the re-development of Abbey End in the 1960s. In order to identify which building is which in our ‘then’ image above, we can use the maps and directory listings from Robin Leach’s Kenilworth in WW2 website. First, the open plot where The Globe stood (left), which was badly damaged and its remains were demolished subsequent to the raid. To the right of the lamppost can be seen a surviving steel lintel beam which stood across the shop frontage of Hanson’s Music Shop which was badly damaged and demolished subsequent to the raid. Behind the Belisha Beacon was Gilbert & Morgan, Wine Merchant (left of centre) which was damaged but patched up with a corrugated iron roof and carried on trading until the 1960s. Next was A J Cooke, grocer (centre) with its bay windows, its roof patched up, sans its pre-War dormer windows. Finally, Jonathan Haycock the butcher (right of centre). These buildings were all demolished in the 1960s Abbey End redevelopment. Buildings to the right of these, including the former Westminster Bank, survive today. In the foreground of our ‘then’ image, the distinctive fins of a model of Ford Anglia, which was built from 1959 – 1968, can be seen, thus showing how late the damaged buildings survived until.